I would expect certain weapon systems to be under a category based off of the stats of the weapon system and what the original manufacturer decided it would be. Basically any flack system of a particular weight would be defined as a defense system. This is a group of flack guns which excel at killing small targets. Perhaps a simple toggle for if it's routed through the ships computer or not would easily decide if it's purely defensive, or if the player should be able to use it offensively as well. I define a system as a part of the ship which performs a specific task. There is a weapon system composed of all the offensive weapons. An engine and shield system which control thrust and shield recharge rate respectively, life support system if applicable, et cetera. The weapon system can have a set recharge rate dependent on the number of pips assigned to it. All of the guns are in particular groups which are defined by the player. By default, all weapons could be in Group 1. Offensive and defensive systems are two separate systems as I just described above. Since they are separate they do not need to both be powered at the same time. I prefer the pip system because it's easier for me to see at a glance how much power I am allocating to every system. It also makes reallocation of energy fairly easy when in a combat situation since you near instantly know what needs to be lowered, and by how much to make a difference in energy distribution in a different system. The player can change weapon groups while mobile also. I should have stated that before. Anyways, I have been arguing for groups this entire time. But only weapon groups, not energy groups. 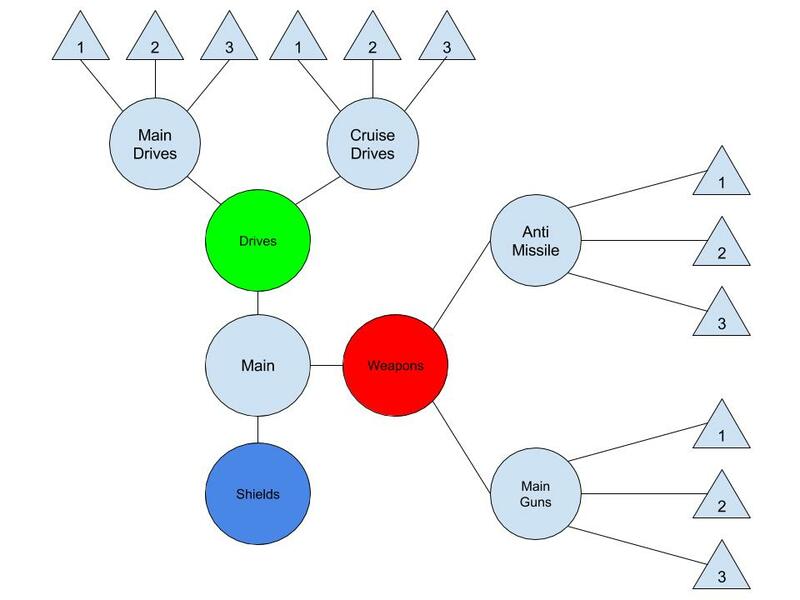 Pips are assigned on the ship system level. why is a thing thats essentially a cannon like any else be filed under a different group than any other cannon? a gun is a gun is a gun and should be put together with all the other guns. and whats a missile defence gun on a capital ship is maybe just a normal gun on a smaller ship, how to handle that without getting weird inconsistencies? we need to argue about arbitrary automatic assignments that cant ever be changed ... why? why do all guns need to have the same energy assignment? If you don't think LT will be able to fit ships with good guns after history generation then I suspect that I will find LT combat to be annoyingly boring and broken. Sounds to me like you have too many extra systems on your ship. Optimize it or get used to painful trade offs. Or buy a better ship, optimize your fleet so you don't have a one ship does all battle cruiser. That's right, I want ships to be diverse and not able to do everything. Does each colored circle represent a powered system? Power can be transferred between systems. There's nothing arbitrary about it. It's for simplicity so that the player doesn't need to look at 30 guns and determine which are powered and which are not. How much power is saved by turning off a turret and then turning it back on compared to just leaving the same turret on standby as you use a different group. Initial power draw is always more than the passive draw. Shutting down half your guns while using only the aft ones only saves you a negligible amount of energy. As in less than one pip unit. and how does this answer why some guns are filed under weapon systems and other under something else? why would some cannons be so fundamentally different from others that they arent even controllable as guns? and its absolutely impossible that i could possibly want to use different weapons than the game determined for some purpose? why am i bound by what the game determines a gun to be on top of its stats? so why are some guns so special that im not allowed to control them as guns? the way i've drawn it there is nothing arbitrary about it, no. but the way you describe it there is. It's for simplicity so that the player doesn't need to look at 30 guns and determine which are powered and which are not. Well, we could make it so that all weapon systems can be defined as offensive or defensive and in doing so define what is and isn't player controlled. This doesn't sound fun to me, but if it's something you can't live without I'm not completely against the idea. I was thinking that certain guns would be grouped together in one large unit that specialized in knocking out missiles or fighter. Basically an array of flack turrets which do all the fine detail work for you. Because missiles are small and you have more important things to worry about than shooting missiles down individually. But you seem to want to have access to that stuff so why not. and just setting any of the weapon groups to "automatic" is a complex thing? create control group, set it to "auto" and maybe set its target priorities. like i'd expect to be able to do with any of my ships. thats how its done in the X games and it works perfectly fine there. no need to hard define some guns as someone not guns because they have certain stats.